Our young church programme is both innovative and exciting. The children learn through discovery either by craft, discussion, games, drama, music or story-telling. The current programme is based on a series called 'Spilling the Beans', so the young ones have decided to call themselves The Bean Team. All children from nursery upwards to include all Primary age children are very welcome to attend (with a parent initially, if it helps). The children meet at 10.30am and join in the first part of the morning service before leaving to have their own time together and are welcomed back at the end of the service to join the congregation as the service concludes. For further information on our Young Church activities, please contact the Church Office. Procedures approved by the General Assembly have been implemented within the Church of Scotland to ensure that the Church should remain a safe place for children and adults at risk. The Kirk Session has adopted the 2010 Policy Statement and Code of Good Practice. You can read the Safeguarding Policy Statement here. Communion Services are normally held on the first Sunday of the month (except July and August) at 10.45 a.m., those in March, June, September and December being the traditional Quarterly Communion Services. Except during holiday periods, an evening Communion is held on the first Sunday of each month at 6.30 p.m.. These are normally held on the first Sunday of the month but can be arranged at other times. To make an appointment to speak to the Minister, please contact the Church Office. Couples wishing to arrange a marriage should, in the first instance, contact the Church Office to make an appointment to speak to the Minister. 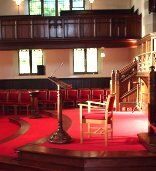 There is a fee of £150 for the use of the church by non-members. There is no charge where one or other of the couple being married is a member, but a donation towards the cost of heating etc. would be appreciated. The fee for the Church Officer is £75. Should a Church funeral service be required please contact the Church Office.